Riparian buffer zones and buffer strips have the following essential functions (Figure 4): (1) to filter polluted overland and subsurface flow from intensively managed adjacent agricultural fields; (2) to protect the banks of water bodies against erosion; (3) to filter polluted air, especially from local sources (e.g., big farm complexes, agrochemically treated fields); (4) to avoid the intensive growth of aquatic macrophytes via shading by canopies; (5) to improve the microclimate in adjacent fields; (6) to create new habitats in land/inland water ecotones; and (7) to create greater connectivity in landscapes due to migration corridors and stepping stones. Figure 1 Example of a hyporheic zone (left). Right: hyporheic flow paths can be lateral and/or vertical, moving in the downstream direction. The log step shown here has collected sediment behind it, forcing hyporheic flow into the streambed and under or around the log. Adapted from Naiman RJ, Decamps H, and McClain ME (2005) Riparia. Ecology, Conservation, and Management of Streamside Communities, 430pp. Amsterdam: Academic Press. Figure 2 Possible combinations of riparian buffer zones. 1 - narrow fertilizer-free buffer strip; 2 - fertilizer-free buffer strips with adapted vegetation: a-different agricultural crop, b-with natural brushwood, c-with grass, d - forested; 3-fertilizer-free buffer strips with adapted layout: a - marsh buffer zone with reduced slope and natural herbaceous vegetation, b - aquatic buffer zone with submerged aquatic vegetation, c - natural reed zone, d - forested marsh buffer zone with reduced slope. Adapted from Hefting MM (2003) Nitrogen Transformation and Retention in Riparian Buffer Zones, 200pp. PhD Thesis, University of Utrecht, The Netherlands. 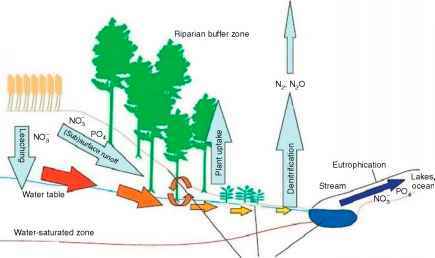 Figure 3 The three-zone riparian buffer system. Adapted from Lawrance R, Williams RG, Inamdar SR, Bosch DD, and Sheridan JM (2001) Evaluation of coastal plain conservation buffers using the reparian ecosystem management model. Journal of the American Water Resources Association 37(6): 1445-1455.
and aquatic fauna. The removal of riparian vegetation increases erosion and habitat loss. 2. Erosion and siltation. Devegetation and changes in river flow have led to an increase in bank erosion and slumping. 3. Grazing. Grazing destroys vegetation, prevents regen eration, and contributes to erosion. It also introduces weeds and nutrients (e.g., from animal feces) to the area. 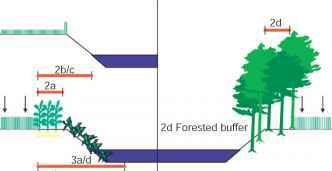 Figure 4 Schematic view of main buffering functions of riparian forest buffer strips. 4. Pests and weeds. They are introduced by grazing ani mals, the dumping of garden, farm, and kitchen wastes, and the removal of native vegetation. 5. Pollution. The riparian zone filters nutrients and pollution (e.g., fertilizers, animal wastes, chemicals) and prevents them from reaching the waterway. It can also, however, be susceptible to the effects of those pollutants. 6. Excavation, filling, and construction. 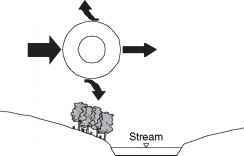 Clears vegetation, influences flow, disturbs stream channels, and acceler ates erosion and sedimentation. 7. Recreation. Wave action created by speedboats and water skiing affects riparian land by increasing erosion. Basically, due to more intensive internal material cycling, energy flows, and the activity of organisms, the riparian zones can be considered to be the most important ecotones of agricultural landscapes. Intensive nutrient cycling within complex riparian buffer zones helps control nutrient flows from watersheds (Figure 5). This is the key function of buffer zones. Several case studies worldwide suggest that different riparian ecosys tems can significantly reduce the nitrogen and phosphorus concentrations in both overland flow and groundwater. Three biological processes can remove nitrogen: (1) uptake and storage in vegetation; (2) microbial immobi lization and storage in the soil as organic nitrogen; and (3) microbial conversion to gaseous forms of nitrogen (deni trification; nitrification; dissimilative nitrate reduction to ammonia (DNRA)). Various biophysical conditions control the intensity of these processes; the variability of their intensity is therefore very high. For instance, gaseous emis sions and plant uptake can vary from <1 to 1600 and from <10 to 350 kgNha 1yr 1, respectively. Thus different pro cesses can play a leading role in nitrogen removal (Figure 6). Storage of phosphorus in riparian buffer zones depends on the following processes: (1) soil adsorption, (2) the removal of dissolved inorganic phosphorus by plant uptake, and (3) microbial immobilization, and, in the case of peatlands, (4) incorporation of organic phos phorus into peat. 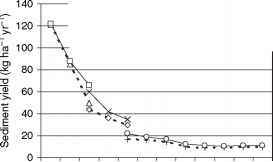 In absolute terms, soil adsorption and vegetation uptake are on a comparable level, varying from 0.1 to 236 and from 0.2 to 50 kgP ha 1 yr \respec tively. However, accumulated P can also be released from the wetland soils of riparian zones, especially after the lowering of input concentrations. Based on the results obtained over c. 30 years, four important aspects in the buffering capacity ofbuffer zones can be highlighted. 1. The removal ofmaterials (suspended solids, nutrients, organic material, heavy metals, pesticides) has a nonlinear character: in the first part of the buffer (0-5 m from the field-buffer borderline), significantly more material (20-60%) is retained than in the remote parts of the buffering ecosystem (Figure 7). 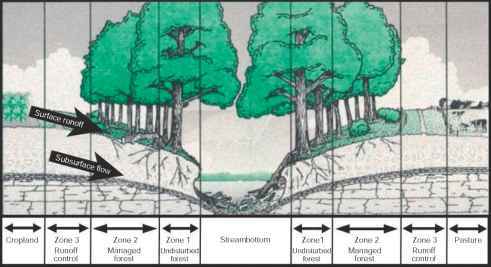 A similar exponential pattern of sediment retention and total N removal resulted from a simulation of three zone riparian buffer zones' purification capacity using the Riparian Ecosystem Management Model (REMM; Figure 8). Figure 5 Schematic view of the buffering of material fluxes in riparian ecosystems. (a) Without buffer, (b) meadow buffer, (c) forest buffer, (d) complex buffer (meadow + forest). Adapted from Mander U and Kimmel K (2007) Wetlands and riparian buffer zones in landscape functioning. In: Hong S-K, Nakagoshi N, Fu B, and Morimoto Y (eds.) Landscape Ecological Applications in Man-Influenced Areas: Linking Man and Nature Systems, pp. 329-357. Dordrecht, The Netherlands: Springer. Figure 6 Cross section of a riparian buffer zone showing hydrological fluxes, nutrient processes, and environmental impacts of nutrient loading. Thicker arrows indicate a higher nutrient loading rate. Adapted from Verhoeven JTA, Arheimer B, Yin CQ, and Hefting MM (2006) Regional and global concerns over wetlands and water quality. Trends in Ecology & Evolution 21(2): 96-103.
where CL is the change in concentration (%) at distance L(m) from the buffer boundary, k is the removal rate coefficient (m J); k = (lnC — lnC2)/L, where C1 is the initial concentration at the field-buffer boundary and C2 is the concentration at distance L from the boundary. Figure 7 The exponential character of nitrate removal in riparian buffer zones, based on the results of several case studies. Adapted from Vought LB-M, Dahl J, Pedersen CL, and Lacoursiere JO (1994) Nutrient retention in riparian ecotones. Ambio 23(6): 342-348. Figure 8 The yield (kg ha 1 yr 1) and reduction (%) of sediment and total N in riparian buffer zones modeled using the REMM. Zones 1-3 as shown in Figure 3. Loading values: high - total field runoff 240 mm, total N load 109 kg ha 1; normal - total field runoff 197 mm, total N load 22 kg ha 1. Adapted from Lawrance R, Williams RG, Inamdar SR, Bosch DD, and Sheridan JM (2001) Evaluation of coastal plain conservation buffers using the reparian ecosystem management model. Journal of the American Water Resources Association 37(6): 1445-1455. 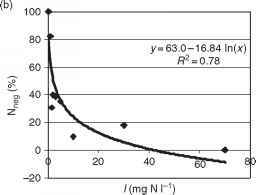 Figure 9 Load-retention relationship of nitrogen and phosphorus in riparian buffer ecosystems. (a) Correlation between load and retention. (b) Relative removal efficiency (retention/load, i.e., y/x; see text) versus. 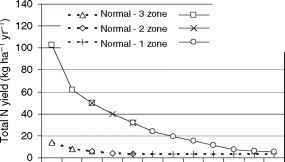 logarithmic load values. Adapted from Mander U, Kuusemets V, Lohmus K, and Mauring T (1997) Efficiency and dimensioning of riparian buffer zones in agricultural catchments. 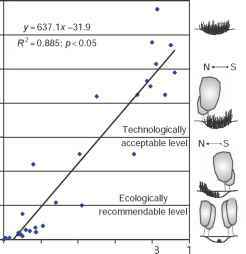 Ecological Engineering 8(4): 299-324. 2. A strong linear regression has been found between the logarithmic values of the initial load (x) and mass removal (y) of both N and P in buffer strips (Figure 9a). However, the relative removal efficiency y/x for both N and P decreases when x increases (Figure 9b). Although the correlation between y/x and load (log x) is not high, the plots clearly demonstrate the decreasing trend of y/x values. The high retention efficiency of buffer strips depends mainly on the heterogeneity of the loading events, that is, the best results occur when polluted water from adjacent fields enters buffers in short events (e.g., during intensive rainfalls and/or intensive thaws). This phenomenon has been documented in several studies on natural buffer strips, and has also been demonstrated in experimental plots. 3. The mass removal of N and P in buffer zones can be negative when the input value is lower than a certain threshold (e.g., <0.3mgNl J). On the other hand, the purification efficiency was always positive when the input value exceeded a certain value (5 m gNl 1 and 0.15mgPl 1 Figure 10). For instance, due to a signifi cant decrease in agricultural intensity in Eastern Europe in the last 12 years, nutrient losses from fields have dropped, but the buffers' outflow values have not chan ged, that is, they were sometimes higher than inflow concentrations. 4. Complex buffer zones consisting of different sequential plant communities and soil complexes have higher purification efficiency than those with a single structure. For instance, a heavily loaded complex buffer zone consisting of grass and forest strips showed rela tively low output concentrations for total N and total P, which are comparable with the output values from the unloaded catena. Also, forest buffer strips on the stream banks between the sedge fens (or wet meadows) can remove the released phosphorus. Therefore a com bination of grasslands (wet meadows) as wider buffer zones (10-50 m) and forest/bush communities as buffer strips (5-10 m) on stream banks is the optimal structure of riparian buffer communities. This is the same structure as develops naturally in floodplains and on stream banks. 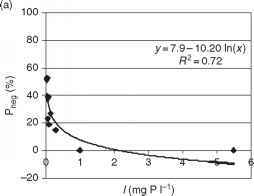 Figure 10 The relation between input concentration (I, mg l 1) and the probability of negative removal of phosphorus (a) and nitrogen (b) (Pneg and Nneg, %). Adapted from Kuusemets V, Mander U, Lohmus K, and Ivask M (2001) Nitrogen and phosphorus variation in shallow groundwater and assimilation in plants in complex riparian buffer zones. Water Science and Technology 44(11-12): 615-622.
warming potential; at present, N2O causes 6% of the radiative forcing of all greenhouse gases. Furthermore, N2O is also involved in the catalytic destruction of strato spheric ozone. The question therefore arises whether riparian zones used as buffers to protect freshwater eco systems are a solution to an environmental problem, or just partially substitute one environmental problem with another, that is, by reducing water pollution but increas ing N2O in the atmosphere. 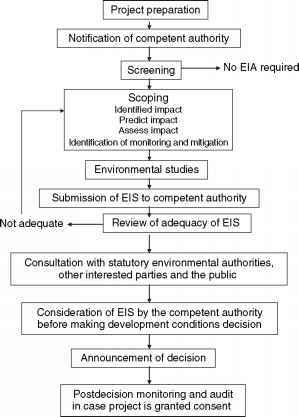 Only a few investigations, however, consider the trace gas emissions from riparian buffer zones. Large quantities of aquatic plants in watercourses reduce water flow and increase the risk of water flooding adjacent to land. Intensive macrophyte growth causes silting of the stream and this in turn accentuates the problem. Therefore, according to a law in most countries of the temperate zones, streams and rivers are primarily mana ged for land drainage and for the reduction of the risk of flooding. The mechanical removal of aquatic macro phytes and some of the marginal vegetation once or twice a year, combined with occasional dredging of the channel, is the most common practice in watercourse management. This method considerably disturbs the trophic structure of the stream ecosystem and, as reported by different authors, leads to more intensive macrophyte growth than before the treatment. Figure 11 Shading influence on aquatic macrophyte growth in lowland streams in Estonia. Adapted from Mander U, Hayakawa Y, and Kuusemets V (2005) Purification processes, ecological functions, planning and design of reparian buffer zones in agricultural watersheds. Ecological Engineering 24(5): 421-432.
acceptable level of aquatic plant biomass (about 300gDWm , shading rate about 0.5; Figure 11) means that macrophyte growth still enables the water flow from drained areas and does not cause a substantial decrease in oxygen supply in critical periods (e.g., in the autumn and in morning hours). This level coincides with the results obtained by other researchers (250 gDW m 2). Simplified schemes in Figure 11 show the typical location of forest and bushes on stream banks leading to respective shading rate and macrophyte growth. However, different authors recommend different tree and bush patterns on stream banks. For instance, Dawson and Kern Hansen recommend larger trees on the northern bank of small streams (width 0-3 m, depth <1m). Several investigations, in contrast, show that this will lead to similar intensive macrophyte growth as in the open lowland streams (Figure 11). Therefore, if the water is flowing in an eastern or western direction, higher vegetation is to be recommended for the southern banks. Nevertheless, all investigations sug gest that light should be reduced to about half of that which is presently available in the open (Sn = 50%). In the occurrence of local atmospheric pollution sources, for example, the application of fertilizers and pesticides from airplanes or helicopters, the filtering of pollutants by cano pies plays an important role in stream protection. During field experiments, a carbamide (urea; NH4CONH2) solu tion was applied as fertilizer on summer barley fields and adjacent alder forest buffer strips, using an airplane. The mean application value (50 kg ha ) was the same in both fields and adjacent buffer strips. Water samples taken from 0.9 m2 gauges installed at different distances from the forest edge in the field and under the tree canopies showed a significantly lower loading under the buffer strips. Although the wind direction was different, only 5-10% of carbamide was found to reach the soil surface under the canopies, in comparison to the values in the open field. Even the out washing from canopies caused by intensive rains in the 1-2 subsequent days (20-30 mm) did not exceed 20-40% of the load in the open area (Figure 12). This experiment also demonstrates a significant edge effect: higher loading values were found directly in the vicinity ofthe forest edge. Although a certain amount of carbamide was absorbed by leaves, the experiment suggests that the filtering of the atmospheric fluxes of pollutants is an essential function of forest buffer strips. 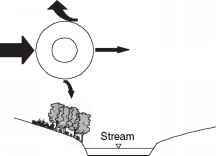 What is the minimum riparian buffer distance that protects hyporheic flow? What are the ecological function of riparian buffers?